Supermassive Black Hole A*: News: Supermassive Eraser Round-up, Round 3! 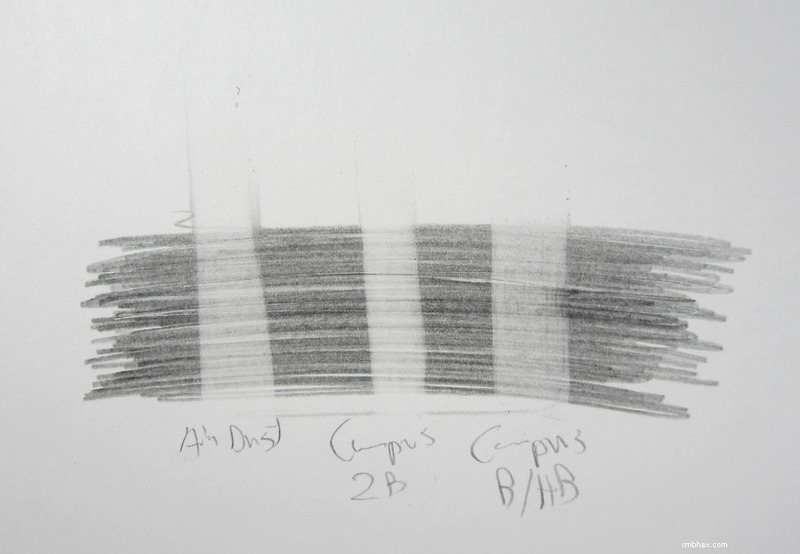 The first order of business is to test our previous erasing champion of hard H-grade lead erasing (see round 1), the Pentel Ain Dust-Gathering, versus the Kokuyo Campus B/HB Student Eraser, an eraser designed specifically for use against hard lead grades. 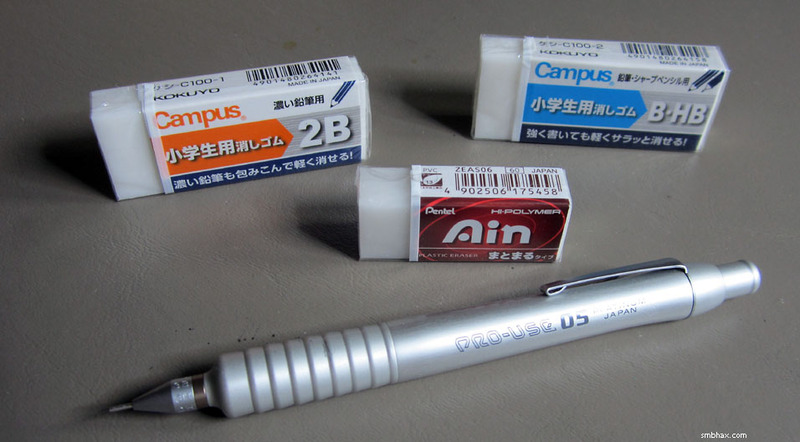 B and HB are the grades just softer than H; Kokuyo also has a Campus 2B Student Eraser, which is my current champ for daily use on the soft 4B lead I use for A* pages (see round 2), and I threw it in here for the sake of comparison. These first two photos will be of tests done on relatively soft, rough, and thick Canson Illustration Paper, which is what I use for ink work, with the Platinum Pro-Use II 05 drafting pencil seen in the photo above doing the layout work in the ubiquitous Pentel Super Hi-Polymer 0.5 mm H leads. 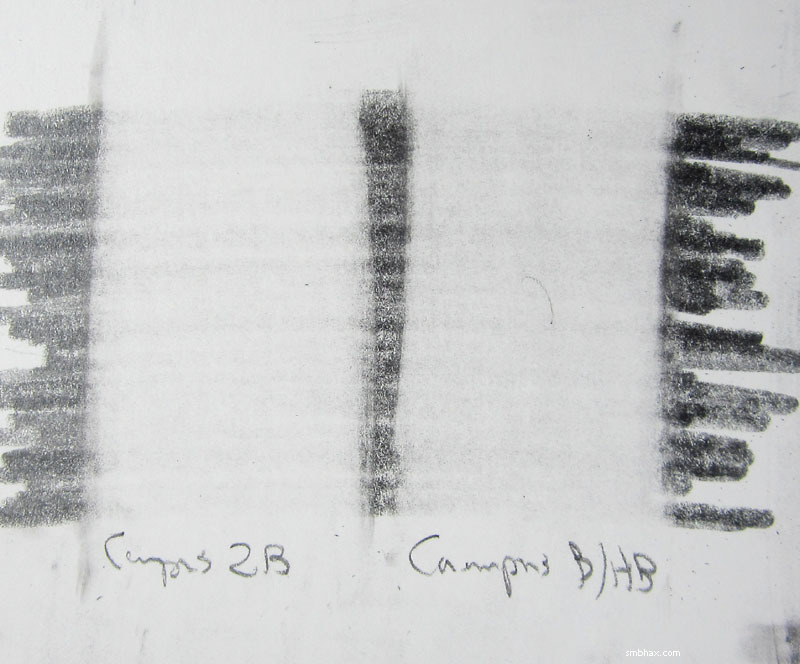 The Campus B/HB was the clear winner there, with much less smudging. So that was pretty easy: the Campus B/HB is my new eraser of choice for my 0.5 mm layout work. :) That makes Kokuyo's "Student" erasers my top erasers for both hard and soft pencil work, so kudos to Kokuyo for making some really fine erasers! You just can't beat their stability in particular. Sanity prevailed and the 2B was indeed better than the B/HB against soft lead. These things do indeed specialize as advertised! 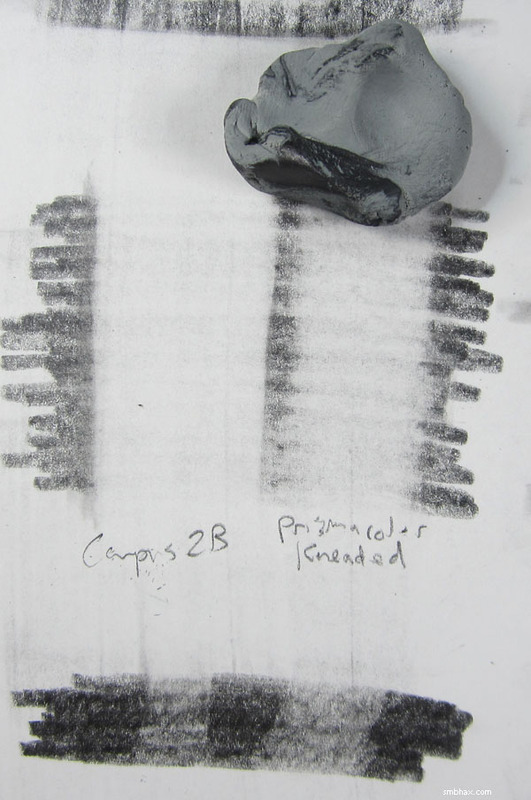 As you can see in the upper section, the kneaded eraser is a relatively poor cleaner; it seems to drive the graphite into little pores in the paper where it can't get them out--even the Campus 2B couldn't get them out once the kneaded eraser had driven them in there, so it creates quite a problem! However, this is not to say kneaded erasers don't have their advantages and uses. 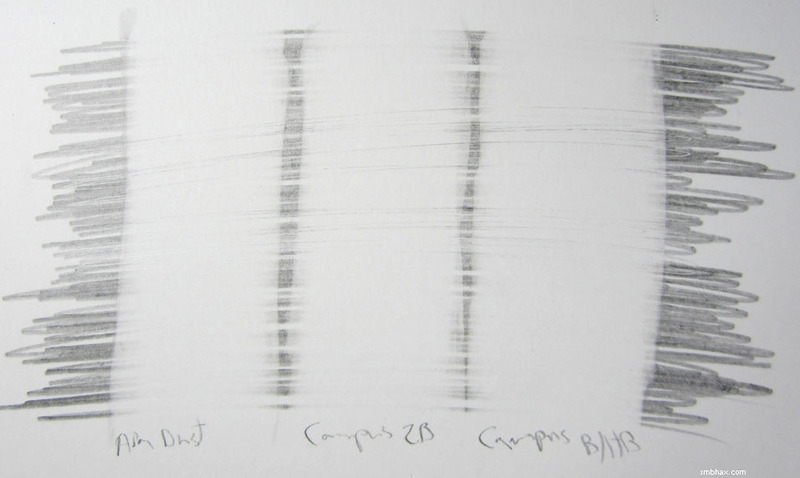 In the lower section there's a smear test, and while the Campus 2B did smear a little, I just couldn't get the kneaded eraser to smudge at all, even though I tried multiple passes over the thick graphite strip. Kneaded erasers don't leave shavings behind like block erasers do, so there's no mess to brush off your drawing and potentially leave smudges in doing so. You can shape kneaded erasers into various forms, like twisting part of them to a thin point for delicate line work; or you can flatten them out and dab them on the page to create very subtle lightening, or various texture effects. So all in all they're very useful if you're doing intricately shaded work, like the photo copying pencil work that's all the rage on deviantART and YouTube. My style, on the other hand, is more high contrast hack and slash, and for that the graphite-eradicating quality of the block erasers is the most important thing. *Next* Monday may be an odd day around these parts: plumbers will in theory be coming to check on an ominous off-color ceiling seepage in my apartment's bathroom (I suspect the plumbing in the apartment above mine may be a bit on the leaky side), and replacement of our building's parking lot is due to begin, which seems likely to involve energetic jack-hammering about twenty feet from my open windows. So possibly my home studio will be uninhabitable, and I'll just have to take shelter with a day pass at the local pinball arcade instead of staying here and slaving away at new A* pages on my drawing table. >_> I don't really think it likely that the horribleness will all come together at once, especially right away in the work week, so probably I'll be able to stick things out here, but one should be prepared for the worst, shouldn't one?